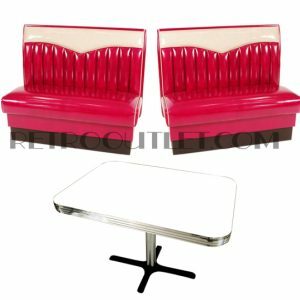 Retro Outlet has a variety of diner booth styles to choose from, offered at the highest quality, and the lowest prices online. Standard diner booth bench lengths are 30″, 44″, 48″ and 60″; standard seat depth is 24″; standard height is 36″. We can also manufacturer your booth in the sizes shown above, as well as custom lengths…just to fit your space! Give us a call if you need a custom size. All our diner booth sets are available in a wide variety of commercial quality upholstery including the ever popular Zodiac and Cracked Ice vinyl’s. For your coordinating table, you may choose from a wide choice of standard as well as our exclusive Boomerang and Cracked Ice laminates. Please allow 4-5 weeks for production of your diner booth set manufactured in your choice of materials…except, our Americo Booth line ships within 7-10 days.